In celebration of the completion of GAC’s Jack Pine Cabin project, the Gabriola Arts Council is mounting an exhibit of the work of Jeff Molloy held in local collections. A photograph of the work in jpg format, maximum file size 2 MB. The dimensions of the work. If it is a 3-D piece, please include height, width, and depth. The name of the piece. The year you acquired the piece, if you remember. Please email all of the above to Margy at margy@artsgabriola.ca using “Jeff Molloy Exhibit” as the subject line. This is a curated show, and because space is limited not all submitted pieces will be included. However, all submitted pieces can be photographed for the Molloy archives, and each piece will receive a Certificate of Authenticity, which is valuable for insurance purposes. Deadline for submission of work for the show is 20 December. The show will be hung on January 15, in time for an opening celebration on January 16. The exhibit will be up until Monday, January 21. This is an exhibit of Jeff’s work—none of the works on display will be for sale. There is no compensation for including the work in this show. Note that the work will not be insured under GAC’s coverage. We recommend that you have your own insurance coverage for the work if you are concerned about loss or damage. Jeff Molloy was an inspired and talented artist who lived on Gabriola Island for many years. 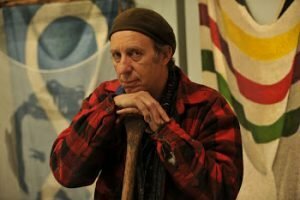 A self-proclaimed “farmer of art”, Jeff was also a dedicated member of the Gabriola Arts Council’s Board of Directors. He championed and led GAC’s Women’s Institute Hall renovation and upgrade project, which was completed after Jeff’s death in August 2016. The new log building, named the Jack Pine Cabin after Jeff’s performance alter ego, will be the administrative office for the Arts Council. 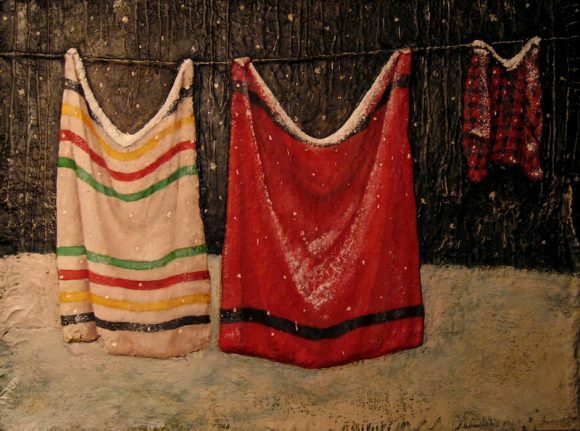 Featured artwork: Canadian Clothesline, from the collection of Chris Boulsbee and Marilyn Campbell.